She is the third woman ever, and the first Indian after Nobel laureate Amartya Sen to have received this outstanding honour. 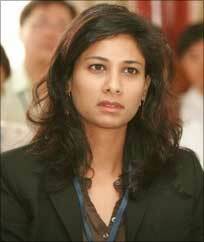 The iconic Harvard University's economic department recently named Mysore girl Gita Gopinath a tenured professor*. Gopinath, who is only 38, received her Ph.D in economics from Princeton University in 2001 and taught at the Chicago Booth School of Business before joining the Harvard economics department in 2005 as an assistant professor. Even though Harvard offered her an admission for PhD it did not give her any financial aid. Fund crunch forced her to go to the University of Washington, Seattle, where she was offered scholarship. She left the university after two years, but was given an MS in economics. She is a faculty research fellow with the National Bureau of Economic Research (a US private, nonprofit research organisation dedicated to studying the science and empirics of economics) and is an associate editor of the American Economic Review, the Journal of International Economics and the Journal of Economic Perspectives. Gopinath's research is in the area of international macroeconomics with a focus on issues related to international price setting, exchange rate pass-through, emerging market business cycles and crisis. Her research has been published in the American Economic Review, Quarterly Journal of Economics, Journal of Political Economy, Review of Economic Studies, Journal of International Economics and Review of Economics and Statistics. Speaking to The Economc Times, Gopinath said the Greek crisis should be good lesson for Indian policymakers. Gopinath said India's projected 7 per cent budget deficit is scary, adding that even though it is small compared to that of the US, but being an emerging nation, India faces a greater risk. Gopinath, who considers herself 'a product of the Indian education system', completed her bachelors in economics from Delhi's Lady Shri Ram College and masters from Delhi School of Economics before moving to the US for a PhD. Daughter of T V Gopinath, a farmer and entrepreneur in Mysore, she is married to Iqbal Dhaliwal, director of policy at the Jameel Poverty Action Lab at Massachusetts Institute of Technology's department of economics. * A tenured professor has a lifetime appointment until retirement, except for dismissal with "due cause". The reason for the existence of such a privileged position is the principle of academic freedom, which holds that it is beneficial for state, society and academy in the long run if learned persons are free to examine, hold, and advance controversial views without fear of losing their jobs. Tenure allows professors to engage in current political or other controversies. Photograph: Courtesy, Harvard University, Department of Economics.